In a week that saw President Donald Trump sign many contentious executive orders, one stood out: the decision to prevent nationals of seven predominantly Muslim countries from entering the US for the next 90 days. The controversial order also bars entry to refugees for the next 120 days, and indefinitely suspends the relocation of any Syrian refugees to the US. The move – which was part of Trump’s election campaign, and is said to be supported by half of US voters – was made to “protect the nation from foreign terrorists”, according to the wording of the order. But many people, including leaders from the business world, see it as a threat to the American constitution and the country’s core values, and they’re speaking out. Facebook’s Mark Zuckerberg wrote a public post criticizing the US president. Apple CEO Tim Cook wrote a rousing email to his staff, pointing out that the company would not exist without immigrants. Google’s Sergey Brin – who moved to the US as a refugee – told employees he was “outraged” by the order. Others went further, putting their money where their mouth is. 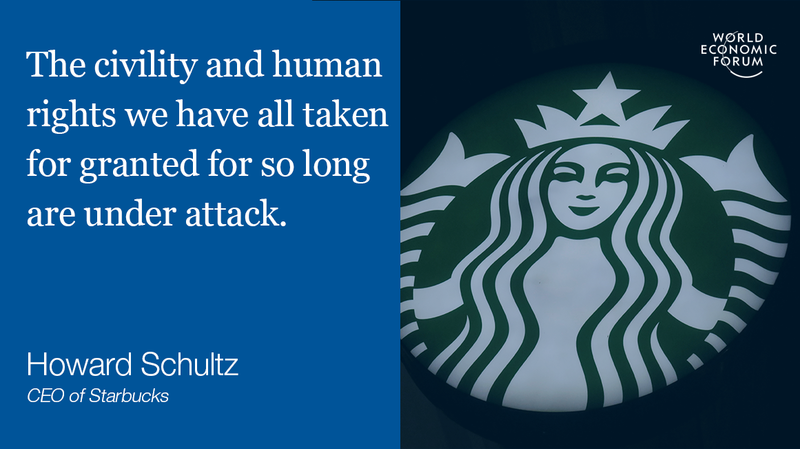 Less than 48 hours after the executive order was signed, Starbucks CEO Howard Schultz wrote to his employees to assure them the company would not stand by as its values were called into question. And to show how serious they were about living out those values, he made a pledge: to hire 10,000 refugees over the next five years. “We created Lyft to be a model for the type of community we want our world to be: diverse, inclusive and safe,” the two founders of one of the biggest car-sharing apps wrote in a post to users. Trump’s latest move was the antithesis of these values, they explained. That’s why they said they were donating $1 million over the next four years to the American Civil Liberties Union, a non-profit organization with the mission of “defending and preserving the individual rights and liberties” of every person in the US. The sweeping and sudden nature of the measures in the latest executive order caught many people off guard, and left some with nowhere to go. “Both my boyfriend and I resigned from our contracts at the end of the year. Right now we have no jobs, no apartment,” Iranian national Samira Asgari told journalists. The scientist had a valid US visa and was due to start a post-doctoral fellowship at Brigham and Women’s Hospital in Boston. Airbnb co-founder Brian Chesky has said his company will step in to help out people in this situation. “Airbnb is providing free housing to refugees and anyone not allowed in the US,” he tweeted. While the ride-sharing giant might have been criticized for its slow response to the executive order – some even accused it of attempting to break an anti-Trump taxi strike – founder and CEO Travis Kalanick has offered to support those affected by the ban. “At Uber we’ve always believed in standing up for what’s right. Today we need your help supporting drivers who may be impacted by the president's unjust immigration ban,” Kalanick wrote in a Facebook post. Among other things, he pledged to compensate affected drivers for their loss of earnings and provide legal support for those attempting to get back into the country.